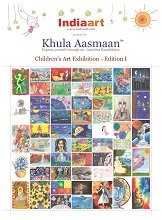 Khula Aasmaan will release catalogs for various contests and exhibitions that will be held regularly. Each catalog featuring select artworks will be made available here for free download. Free Download : Khula Aasmaan catalog for the first contest held in November 2015 is now available for free download. This catalog was published in January 2016 along with a grand exhibition at Mumbai. Download this beautifully produced catalog from Khula Aasmaan section of Indiaart.com. The catalog features prize winning entries as well as other select artworks.